Batch's frequency capping allows you to limit the number of notifications a device can receive in a customisable time frame. Alerts in real-time with the Transactional API (e.g. order confirmed, delayed flight, friend request, etc). Recurring push notifications to automatically onboard newcomers or retain existing users. And one-time campaigns to let your users know about new content, sales, and more. You can adjust the frequency capping for your app in two different ways from the dashboard settings > Cappings. Frequency capping is available on the Enterprise plan and, as an option, on other paid plans. All push notifications: The capping rules will affect all your push notifications. 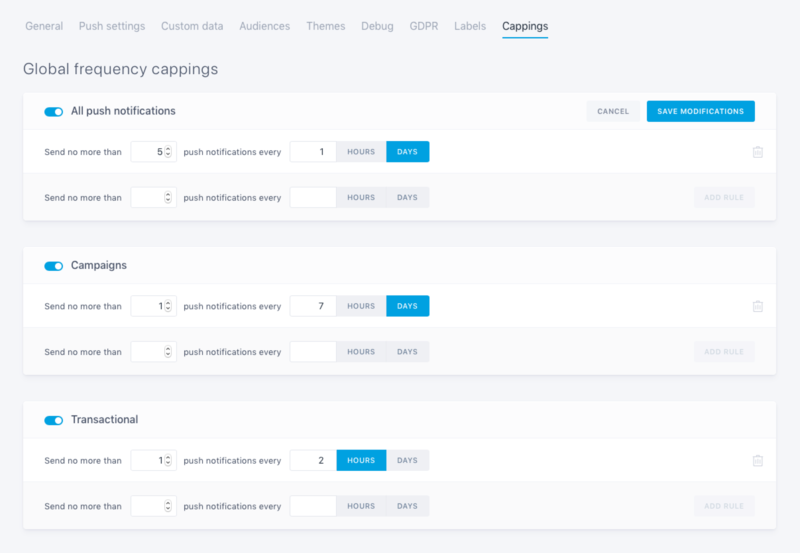 Campaigns: The capping rules will only affect notifications coming from campaigns created on the dashboard or with the Campaigns API. Transactional: The capping rules will only affect real-time notifications sent with the Transactional API. All these rules can work together. For example, you can set a global capping of 5 push notifications per day and create two additional rules that will ensure users won't receive more than 1 transactional push every 2 hours and 1 push from a marketing campaign per week. If you are looking for a more granular way of capping the number of push notifications a single device can receive, you can set a label-based frequency capping. Please note all rules are dynamic. Batch will check the number of notifications that have been sent in the last X hours/days to see if the notification has to be sent or not.